Finding the perfect Tacori engagement ring is easier said than done, mostly because each ring is brilliant in its own right. There are also so many things to consider before settling on "the one" for your future bride, so you definitely don't want to leave anything to chance. You also don't want to leave your ring-buying decision in the wrong hands or else you run the risk of getting talked into buying a ring well above your budget, or worse, getting ripped off. To ensure that you're getting the best possible Tacori ring-buying experience around, let Icing On The Ring be your jeweler of choice when it comes time to buy your lucky lady the Tacori engagement ring of her dreams. What you see is what you get at Icing On The Ring. Here are four reasons why. Tacori categorizes its retail partners into four separate tiers: Blue Diamond, Platinum, Gold, and Silver. Tacori views Icing On The Ring as a premium brand that can truly provide the Tacori experience to its customers. For this reason, Icing On The Ring is ranked amongst the top Tacori retailers and is the only Platinum Partner in the greater Los Angeles and Orange County area. You can guarantee that Icing On The Ring will continue to uphold its duty as a Platinum Partner and provide you with an unprecedented experience when it's time to select the perfect Tacori engagement ring. When Icing On The Ring first became an official Tacori retail partner in 2012, Tacori recognized the experience customers received when purchasing Tacori jewelry and quickly raised our partner level to Platinum. We love Tacori jewelry ourselves and know the brand and the entire product catalog inside out. Our certified gemologist and jewelers are experts at all things Tacori and will go over any questions you may have to help you find the perfect Tacori engagement ring for your lucky lady. At Icing On The Ring, you can be rest assured that you will be treated like royalty from the first time you step foot into our showroom. We take pride in providing unparalleled customer service no matter what it takes, especially when Tacori is involved. Other big box stores may sell Tacori, but we will go above and beyond to ensure that each and every one of our customers is treated like family. This way, you don't feel like you're getting the typical sales-y experience that is all too common amongst big box jewelers. You can be sure that our team will help you find, select, and choose a Tacori engagement ring that is just right. Not all Tacori partner tiers are created equal. 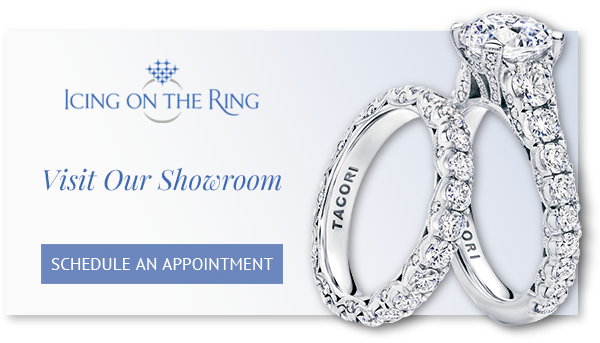 As a Platinum Partner, Icing On The Ring is entitled to an extensive Tacori inventory. The diamond engagement ring selection and quality you will get with your Tacori purchase will be superior than what you can expect from jewelers who aren't as highly rated (i.e. many big box jewelers). At Icing On The Ring, you get the best of both worlds -- quality and quantity with your Tacori diamond engagement ring shopping experience. We've been in business for more than 40 years and have maintained our "family-owned" approach to customer service through and through, which has earned us our coveted five-star rating in the jewelry and wedding industries.